Minimising your spend on oily water treatment starts before you even look at a separator! Controlling the size of your oil droplets will greatly reduce the amount of money you need to spend on a separation system. The bigger your oil droplets are, the easier they are to remove and the less money you’ll need to spend on treatment. Did you know you can control the droplet size with a few simple practices? Certain detergents and degreasers can emulsify your oily water droplets, making them much smaller and therefore needing a much more powerful separator to achieve the discharge quality. By simply changing the type of detergent used in a workshop, you can greatly improve the size of your oil droplets and need less separation force downstream to effectively treat your water – saving you money. Big oil droplets mean the equipment required will be cheaper and easier to run. Small pit = bigger treatment system. Large pit = smaller treatment system. The design and size of your oily water pits has a direct relationship on the size and cost of your required oily water treatment system. Good pit design builds in a buffer for the potential flow, so that the separator does not need to be sized for the peak demand. If you build just a small oily water sump, your treatment system must be sized to treat whatever the maximum flow rate would be (so that the pit never floods). This is an expensive option! If you build a larger sumps (with buffer capacity) then your treatment system can be much smaller – sized to treat the average flow instead of the maximum flow, which is usually much lower. Ultraspin offers the full service – we don’t just sell you water treatment equipment, we help you solve your oily water issues. We find ways to make your droplets as large as possible. We help you design your pit to be most cost effective. In other words – we find ways to minimise the separation equipment you need. Every site is different – we look at your unique requirements and make recommendations. If you’re after some tips or feedback on how you can minimise the size and complexity of your oily water separator, call us and have a chat to one of our engineers. Once you have solved your upstream issues, it’s time to choose a separator system that will be the cheapest overall. This includes much more than just the purchase price! Would you purchase a car based just on purchase price without considering running costs? A cheap clunker car breaks down more often, is often a fuel guzzler, depreciates rapidly, cost more to service, costs more for spares, and often the manufacturer doesn’t offer post-purchase support. The result is higher costs and more headaches – a better car that was a little more expensive in the beginning can be better deal in the long run. The same is true of oily water separators. Just like an old car, there are many hidden costs for running a separator. Do you know what the TRUE cost of your separator is? There’s no point buying a hatchback when you really need a 4WD. Don’t waste your money on a separator that won’t work in your application! No separator is “one size fits all” so questions should be raised if you see any unconditional performance guarantees – especially when you haven’t been asked any questions about your application. How do you choose the right separator for you? It’s all about droplet size! While this may seem obvious, not all separator vendors will disclose the micron size they are rated to treat! Not sure what oil droplet size you have? Skimmer – You don’t want to leave all of the oil in the pit or underground – it makes it smell revolting, it puts you at great risk of oil flooding over the top from the pits. In some cases storing oil underground is against the law. A skimmer solves these problems, and will also help ensure you have big oil droplets. See skimmer page for more info on types of skimmers available. Strainer – Maintenance requirements and costs increase significantly without a strainer to remove trash and debris. 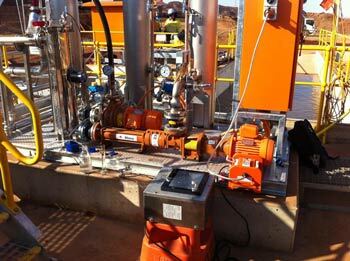 Pump – It sounds crazy but some separator quotes don’t even include the pump to feed the oily water to the separator! Oil storage tanks – Even if these tanks are included, often they are limited to as small as 20L. Either the vendor isn’t confident that their separator can actually remove oil from the water or someone will be constantly emptying the oil tank! Freight – some equipment, particularly gravity and coalescing systems as they require high residence time for separation, can be quite large and freight can put a large dint in your budget. Often these systems also require cranes for loading and unloading. Materials of construction – Most customers require a design life of at least 10 years, often more. So many standard materials of construction (plastic, cast iron, galvanised steel etc) are not suitable and need to be changed for more robust materials. Maintenance aides – some separators, particularly coalescing separators and above ground gravity systems, require access platforms, a crane or lifting winch and a separate cleaning pad for maintenance. At Ultraspin, we pride ourselves on providing you with a complete solution so there are no nasty surprises. If you are responsible for buying and installing a separator, watch out for installation costs which can sometimes be more than the cost of the equipment! Treated water tanks and pumps – many systems only deliver the treated water by gravity. So many customers require another tank, pump and level switch to deliver the treated water to the reuse or discharge point. Excavation Costs – Underground systems entail significant excavation costs, including lining and bracing the hole and anchoring the equipment. Plug and play – Installation costs can increase significantly if the equipment is not skid-based and plug and play. Installation takes longer, requires more materials and can involve more mistakes. The well-thought design of Ultraspin systems means that you don’t need additional pumps and tanks for treated water as we deliver treated water at pressure, our equipment is installed above ground and is plug and play with pneumatic options available for lower installation and ongoing costs. Often even if you’ve found a separator that’s suitable for your application with a lower installed cost, these savings are quickly eroded once you start using the system. The design of the equipment and it’s mechanism for treating the oily water dictates its operational and maintenance requirements and therefore the true ongoing cost of the equipment. So we’ve broken down these requirements for you based on the separator type. Remember that some of these separator types may not even work in your application, so check the micron rating that you need and how to choose a suitable separator here. Sediment removal – even with well-designed pits upstream, sediment will accumulate and block the plates/coalescer over time. For the equipment to be able to treat the water, these blockages must be removed immediately! High maintenance frequency – most plate pack vendors recommend a FULL clean at least even 3 months. However many customers don’t have the luxury of having large, well designed sediment pits upstream and low sediment loads in their waste water. Some customers find they need to complete full clean outs every few weeks! Health and safety – maintenance will require working at heights and lifting to remove the plates/coalescer. This automatically increases the cost of maintenance. Two people minimum – Dedicating two people to clean your plate pack, which can sometimes take several days, becomes expensive very quickly. Often contractors are engaged to perform this maintenance with bills as high as $10000 per service. Even if you can get away with quarterly clean outs that’s at least $40000 a year! Replacing the packs – Even well maintained plate packs disintegrate under the weight of the sediment and exposure to oil, chemicals and high temperatures. The cost of replacing the plates every year or so must be considered. Short design life – have to be replaced every few years due to plastic and low spec construction. Sediment removal – sediment is captured in the first compartment requiring frequent pump outs. Often external contractors are required charging you for their time, equipment hire, health and safety requirements and removal and disposal of not only the sediment, but the water in the tank too! Oil removal – oil is stored inside the equipment. Often removal is done by external contractors who again will charge you for their time, equipment hire, health and safety requirements and removal and disposal of the water as well as the oil! Pumps and other components – must be rated for use in hazardous areas as they are inside a compartment containing oil. Are therefore very expensive to purchase and limited access makes them time-consuming and expensive to replace. High maintenance frequency – Often there are no reliable or automatic indicators that sediment or oil has built up and needs to be removed. Frequent pump outs are therefore required. If these are not performed, the system may not be treating the water at all! Controlling the size of your oil droplets will greatly reduce the amount of money you need to spend on a separation system, and will determine what separator types will work for you. You need to know your droplet size before you buy a separator. Every oily water separator is rated to treat a particular oil droplet size. The next step is to narrow down your choice of separator technologies that are available for your application, based on what droplet size each separator technology is designed to treat.